The rise of digital photography has been apparently inexorable; its ascent, from a niche tool of use only to professionals to a full-blown consumer phenomenon, has transformed the ways in which people take, view and share photographs. However, while the digital camera has all but done away with film for consumers, many individuals now own photo printers in order to produce hard copies of their shots. These can be thought of in the same way as a very small developing lab. It is true that far more photographs are shared online than are printed, but many individuals still value a physical copy of their images. Digital photo frames aim to address this problem. Rather than printing images and then placing them in conventional photo frames, digital photo frames allow you to display your digital images without any physical copy. Think of them as a small computer screen, constructed to look like a conventional photo frame. These frames either have their own storage built in, or they have the ability to interact with your existing storage – for example a memory card or a USB stick. There are a number of considerations to address when thinking about which digital photo frame to buy. Size will clearly be a primary concern. Most digital photo frames come in standard photo sizes and aspect ratios; however, many manufacturers choose to advertise the size in the same way that computer monitors or TV screens are measured – that is, as a single measurement, from one corner to the opposite corner. Latterly, digital photo frames are capable of working out which way up they are standing, and rotating your image accordingly. This adds to the flexibility of the frame, but you should do a bit of research on individual models if this feature is important to you, as some frames fail to render images properly when they rotate. As well as rotation, many frames also offer features like slideshows. This allows you to load a series of images into the frame, which will then be scrolled through continuously. You should be able to set the slideshow to display either in a set order, or at random. Furthermore, some frames are capable of playing video. You should remember, however, that video-ready frames with relatively small capacities will only be able to store very short clips. Another important consideration is the way in which the digital photo frame accesses your images. Many frames have a slot for a memory card, such as an SD or Compact Flash card. While this is great for taking images straight off your camera and into your frame, it is also limiting in that it makes it more difficult to do post-production before displaying your shots. Similarly, unless you want to be constantly swapping your memory card between frame and camera, you will need to buy a new memory card. Perhaps more useful are digital photo frames that accept a USB stick. This allows you to touch up your pictures in Photoshop and keep your card in your camera. Alternatively, some frames will utilise wifi to access images on shared files on your computer. 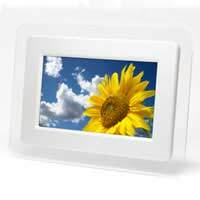 Digital photo frames have seen an explosion in popularity in recent months. As they become more widely available, cheaper, and equipped with better technology, there is a serious likelihood that they might remove much of the need for conventional prints.